Rilpivirine is a non-nucleoside reverse transcriptase inhibitor, recently developed as a drug of choice for initial anti-retroviral (ARV) treatment of HIV-1 infection, whereas estradiol is a major component of hormonal contraceptives. Both drugs have effects on lipid metabolism, impairment of adipocyte differentiation and alteration of adipose tissue distribution and function.This study investigated the effects of different concentrations of either rilpivirine or estradiol either alone or in combination on adipocyte differentiation and adipocytokines status in vitro in the absence and presence of β-naphthoflavone, (BNF),a potent agonist of the aryl hydrocarbon receptor. 3T3-L1 human pre-adipocytes were cultured and differentiated with different concentrations of treatment drugs. After 10 days of differentiation procedure, cells were examined for their morphology and viability. Glycerol,adiponectin, leptin, resistin and interleukin-8 (IL-8) were quantified using commercially available kits. The results show that either rilpivirine or estradiol individually or during their combination can evoke significant increases in glycerol release and a concomitant significant decrease of adiponectin from adipocytes. These effects were dose–dependent. The effects of combined treatments were much larger than individual concentration for each drug. Both drugs had little of no effect on leptin levels, except for a small decrease with 10 µM rilpivirine alone or when combined with estradiol. In addition, both drugs evoked small increases in the release of resistin and interleukin-8 with significant values at higher doses compared to untreated adipocytes.When adipocytes were pretreated with BNF, either rilpivirine or, estradiol or when combined evoked a much larger release in glycerol and a much larger decrease in adiponectin compared to the absence of BNF. In contrast, BNF pretreatment had little of no effect on either leptin, resistin or IL-8 metabolism compared to the results obtained in the presence of either rilpivirine or estradiol alone or in combination.These results show that rilpivirine and estradiol either alone or when combined or pretreated with BNF can evoke marked effects on glycerol and cytokines levels from adipocytes. However, their mechanism (s) in inducing adipogenesis warrants further investigation of different transcription factors at gene expression levels. Obesity is a major global health problem and if left untreated, it may lead to major complications . It is attributed to a number of factors including over-eating, sedentary lifestyle, lack of physical activity, genetics, diets rich in carbohydrate, frequency of eating, hormonal and various psychological factors as well as others. Some medications are also associated with weight gain. These include certain anti-depressants, anti-convulsants, some diabetes medication and certain hormones including leptin, insulin, estrogens, androgens and growth hormones [2, 3]. Rilpivirine is a prescription medicine for the treatment of HIV infection in adults and children. Although the approval document of rilpivirine issued in 2011 by the U.S. Food and Drug Administration (FDA) included fat re-distribution among its warnings and precautions, contradictory results showing its effect on the adipose tissue distribution and function have been presented by previously conducted clinical trials [4, 5, 6, 7]. On the other hand, 17β-estradiol is a major component of hormonal contraceptives and it acts primarily as an agonist of the estrogen receptor (ER). Several studies have provided evidence of a hormonal regulation of pre-adipocyte proliferation [8, 9]. Estrogen promotes subcutaneous fat and regulate adipose tissue distribution through its receptors, ERα and ERβ [10, 11]. 17β-estradiol has been shown to have stimulatory effects on proliferation of female rat pre-adipocytes  and in human pre-adipocytes . The British HIV guideline for the management of HIV infection indicated that rilpivirine is an appealing option to consider in women of childbearing potential. At the same time, it also warns of the significant pharmacokinetic and pharmaco-dynamic interactions that have been reported between the anti-retroviral (ARV) drugs and hormonal agents. Inducers of hepatic enzymes by ARVs may result in increased breakdown of estrogen that can compromise contraceptive efficacy . In addition, both of these drugs are known to alter lipid metabolism and fat distribution in the body [15, 16]. Therefore, a mechanistic insight into the elucidative role of concomitant use of rilpivirine and estradiol would provide more robust and reliable prediction of their potential interactions on the adipogenesis pathway. Organic pollutants such as β-naphthoflavone (BNF) tend to escape from the body metabolic system and accumulate in the white adipose tissue (WAT),thereby affecting its physiological role, leading to the development of obesity-related disorders . The mechanisms through which such chemicals modulate the differentiation, metabolism, and secretory function of adipocytes are numerous [18, 19, 20, 21]. Aryl hydrocarbon receptor (AhR), a cytosolic ligand-activated transcription factor that participates in a variety of metabolic processes, including detoxification and adipogenesis, has been reported to be functionally present in rodent adipose tissue [17, 22]. 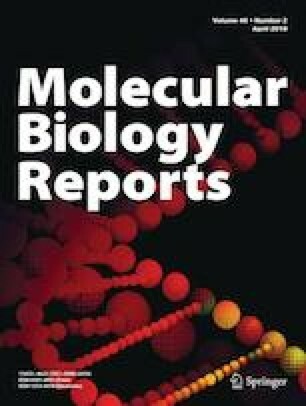 Activated AhR modulates expressions of various genes involved in xenobiotic-metabolizing pathways, such as cytochrome P4501A1 (CYP1A1) [23, 24, 25]. CYP1A induction may be used as a biomarker of exposure to toxic substances in order to ascertain whether in vitro models could be useful in investigating the bio activation potential of environmental contaminants. Therefore, this study investigated the effect of rilpivirine and estradiol either alone or in combination on the adipose cells measuring free glycerol and a number of inflammatory markers including leptin, and adiponectin, resistin and IL-8 which are associated with adipocyte function. In another series of experiments, rilpivirine and estradiol were combined with an environmental pollutant, BNF to determine any inhibitory or stimulating effects. Adipose derived mesenchymal stem cells were obtained from HimediaTMCat.# CCK011. Complete medium and adipogeneic differentiation medium were also purchased from Himedia Cat.# AL521 and Cat.# AL537 respectively. Cytotoxicity kit was purchased from PromegaTMCat.# G1780 to check the cell viability. Free glycerol and Adiponectin were measured using Abcam’s Lipolysis Assay kit (Cat. #ab185433) and Human Adiponectin ELISA kit (Cat.#ab99968). Other adipocytokines were quantified using the kits from Sigma Aldrich: Human Leptin Elisa kit (RAB0333), Human Interleukin-8(IL-8) kit (Cat. # RAB0319) and Human resistin ELISA kit (Cat. # RAb0419). 3T3-L1 adipose cells were incubated for 3–4 h in a humidified CO2 incubator with 5% CO2 at 37 °C temperature and then replenished with complete medium. Cells were sub-cultured after reaching 70–80% confluency by gently aspirating the spent medium and washing the cells with 2–3 ml of Dulbecco’s phosphate buffer saline (DPBS). Fresh flasks were seeded at a density of approx. 0.125 × 106 cells/cm2 of the flask. This seeding density was recommended as per the manufacturer’s instructions (Himedia Cat.# CL007). Differentiation into adipose cells was done in the presence of the same culture medium as used before and supplemented with adipogenic differentiation medium. Addition of treatment drugs was initiated on day 0 and continued throughout the differentiation period of 10 days. Fresh drugs were added each time the medium was replaced. The medium was replaced every 2–3 days. Stock solutions of 17-β estradiol and BNF were prepared in differentiation medium while DMSO was used for preparing rilpivirine. They were then aliquoted and stored at − 20 °C prior to use. Working solutions of the treatment drugs were prepared by diluting them further. Potential cytotoxic effects of drugs were determined using a CytoTox 96 non-radioactive cytotoxicity kit following the manufacturer’s protocol. Cell viability was assessed on day 0, 5 and 10.CytoTox 96® reagent was added to each well containing the sample and incubated for 30 min. Stop Solution was added, and the absorbance signal was measured at 490 nm. Commercially available Abcam’s Lipolysis Assay kit was used to measure glycerol released from 3T3-L1 cells. A volume of 0, 2, 4, 6, 8 and 10 µL of 1 mM glycerol standard was added into series of wells to generate 0, 2 ,4 ,6, 8 and 10 nmol/well of glycerol standards and the volume of each well was adjusted to 50 µL with Glycerol assay buffer followed by 50 µL of the reaction mixture. Incubation was done for 30 min and absorbance was read at 570 nm. Sample readings were applied to the standard curve to get nmol of glycerol amount in the sample wells. The concentrations of adipokines and cytokines released by adipocytes following treatment with the drugs and accumulated in the cell culture medium were measured at the end of 10 days of differentiation process employing established specific assay kits. 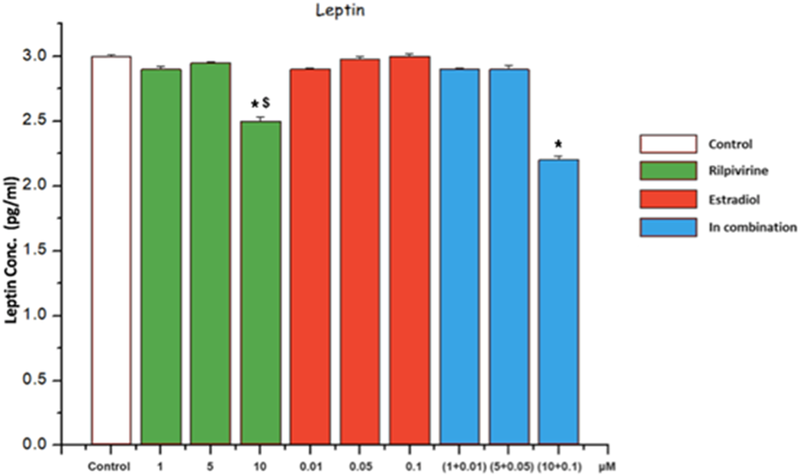 Commercially available Human Leptin Elisa kit was used for the quantitative measurement of leptin in cell culture supernatant. Standards were prepared by subsequent serial dilution of leptin standard using 1X Assay diluent B. A volume of 100 µL of each standard and sample was added into appropriate wells and incubated overnight at 4 °C. The plate was washed four times with 300 µL of Wash Buffer. After this, 100 µL of 1X Detection Antibody was added and incubated for 1 h followed by washing step. A volume of 100 µL of HRP-Streptavidin was added to each well and incubated for 45 min. The plate was washed again and 100 µL of TMB reagent was added to each well. It was then incubated for 30 min. Reaction was stopped by adding 50 µL of Stop solution and absorbance was taken at 450 nm. Sample concentrations were calculated using the equation of the standard curve. 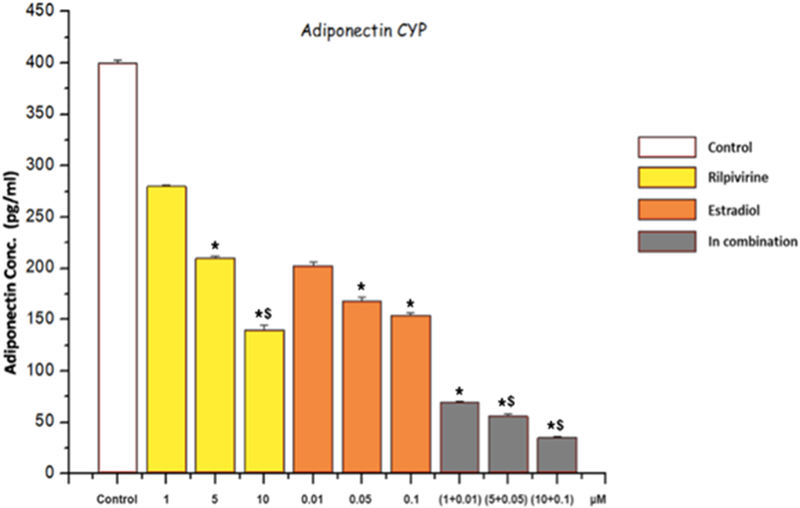 Abcam’s Human Adiponectin ELISA kit was used for the quantitative measurement of human adiponectin in cell culture supernatant following the manufacturer’s instructions. Serially diluted standards were prepared using adiponectin stock standard. A volume of 100 µL of each standard and sample was added into appropriate wells and incubated overnight at 4 °C. Wells were washed four times with 300 µL of 1X wash solution. After this, a volume of 100 µL of 1X biotinylated detection antibody was added to each well and incubated for 1 h. Wells were washed as before and 100 µL of 1X HRP-streptavidin solution was added to each well and incubated for 45 min. A volume of 100 µL TMB substrate reagent was added followed by 30 min of incubation. Reaction was stopped by 50 µL of stop solution and absorbance was read at 450 nm. 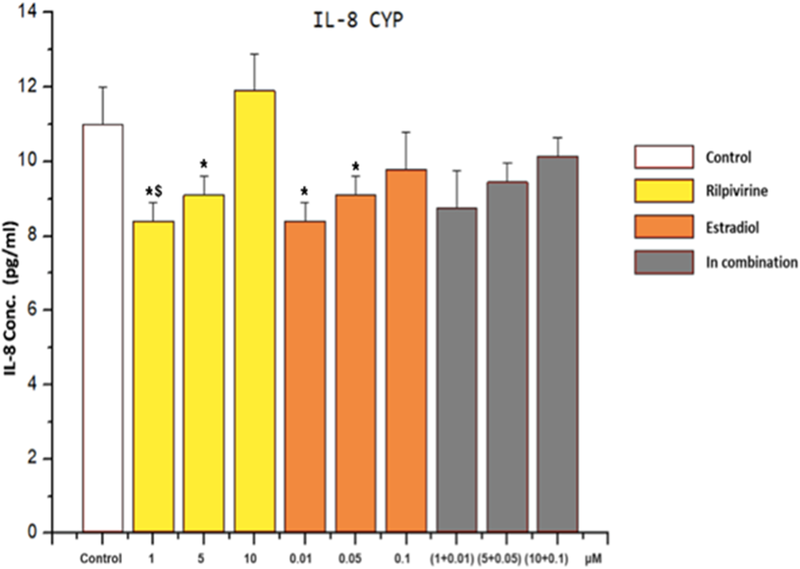 Human interleukin-8 (IL-8) kit was used for the quantitative measurement of IL-8 from cell culture supernatant following the manufacturer’s protocol. Serial dilution was performed to prepare standards. Assay Diluent B served as the zero standard (0 pg/mL). A volume of 100 µL of either standard or sample was added into appropriate wells and incubated for 2.5 h. The wells were washed four times with 300 µL of 1X wash solution. After this, 100 µL of 1X prepared biotinylated detection antibody and incubated for 1 h. A volume of 100 µL of prepared HRP-streptavidin solution was then added and incubated for 45 min followed by 100 µL of TMB reagent and 30 min incubation. Finally, a volume of 50 µL of stop solution was added and absorbance was read at 450 nm. Sample concentrations were calculated using the equation from the standard curve. 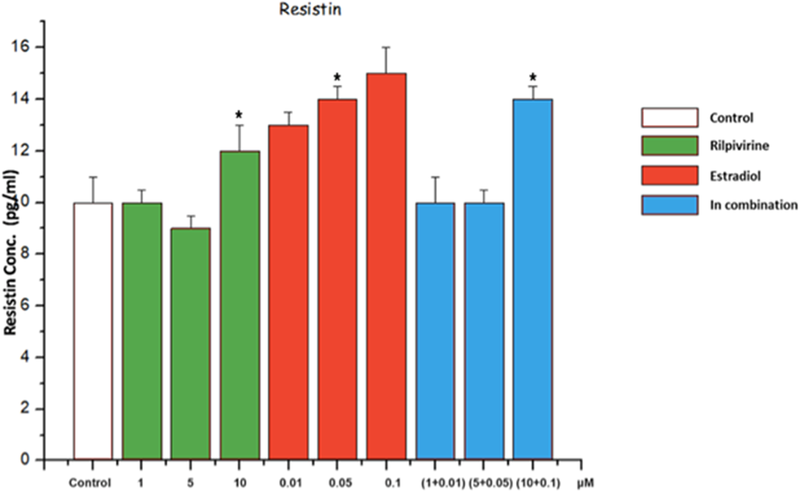 Resistin was quantified from the cell culture supernatant using the human resistin ELISA kit following the protocol from the manufacturer. Serially diluted standards were prepared using resistin stock standard. A volume of 100 µL of standard or sample was added into appropriate wells and incubated for 2.5 h. Wells were washed four times with 300 µL of 1X wash solution followed by 100 µL of 1X prepared biotinylated detection Antibody and 1-h incubation. After this, a volume of 100 µL of HRP-streptavidin was added to each well and incubated for 45 min. After washing, a volume of 100 µL of TMB Reagent was added and incubated for 30 min. Finally, a volume of 50 µL of stop solution was added and absorbance was read at 450 nm .Sample concentrations were calculated using the equation from the standard curve. All control and test data were analyzed using the Mega Stat software from Microsoft Excel. Chi Square goodness of fit test was applied and the p value was obtained. All data obtained were expressed as mean ± standard deviation (S.D). Each experiment was repeated three times but performed in duplicate (n = 6) to ensure the accuracy of results. A value of p < 0.05 was taken as significant. Figure 1 shows human pre-adipocytes that were differentiated in culture in the presence of different concentrations of either rilpivirine or estradiol either alone or combined for a period of 10 days. The results show that untreated cells on day 0 display spindle shaped, fibroblast-like appearance with undetectable lipids. However, with the progression of adipogenesis, mature adipocytes attain a round shape and become laden with lipids. Cell viability was assessed for the two series of three different experiments measured in duplicates (n = 6) by employing lactate dehydrogenase assay. The results are shown in Tables 1 and 2. Values were expressed as the percentage test cells surviving compared to control cells. The results in these tables show no significant (p > 0.05) difference in cell viability with drug treatments compared untreated control. In this and subsequent figures, values are presented as means ± SD from duplicate set of experiments expressed relative to values from untreated control cells. n = 6;* p < 0.05 for control compared to drug treatments. The data presented in Fig. 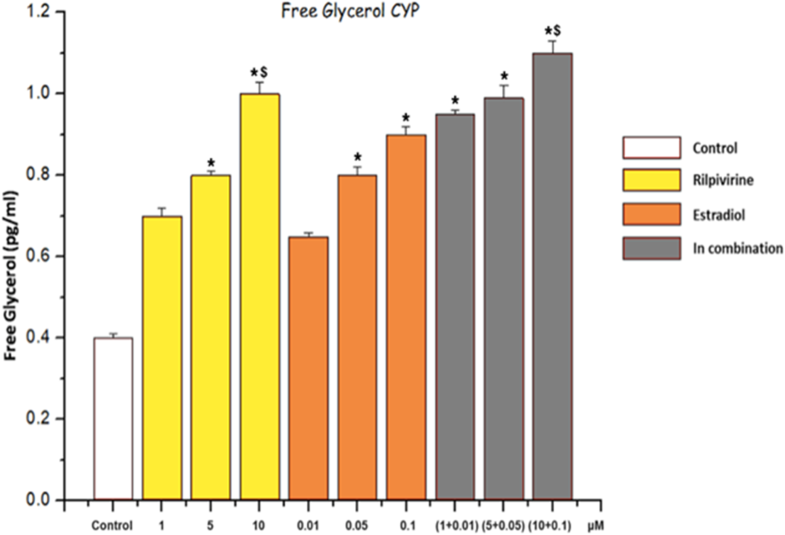 2 show the effects of different concentrations of either rilpivirine or estradiol alone or in combination on the release of free glycerol from human adipocytes. The results show that all drug treatments can evoke significant (p < 0.05) increases in free glycerol release from human adipocytes compared to untreated control, except for 0.01 µM estradiol, which induces only a small increase in free glycerol. Figure 3 shows the effect of rilpivirine and estradiol either alone or in combination on the release of leptin by human adipocytes in culture for 10 days. The results show the different types of drug treatments had little or no effect on leptin release, except for 10 µM rilpivirine alone or when it was combined with 0.1 µM estradiol when a significant (p < 0.05) decrease in leptin release were observed. The results presented in Fig. 4 show the effect of rilpivirine and estradiol either alone or in combination on the release of adiponectin from human adipocytes in culture for 10 days. The results show significant (p < 0.05) decreases in adiponectin release for all drug treatments compared to untreated control, except for 1 µM rilpivirine. 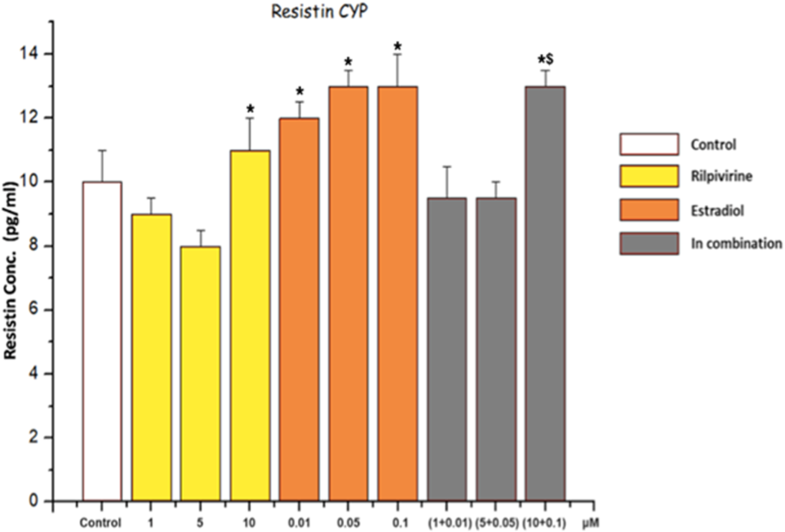 The results show effect of rilpivirine and estradiol either alone or in combination on the release of resistin from human adipocytes in culture for 10 days. The data reveal significant (p < 0.05) release in resistin for all drug treatments compared to untreated control except for 1 and 5 µM rilpivirine and rilpivirine (1 and 5 µM) combined with estradiol (0.1 and 0.5 µM) (Fig. 5). Figure 6 shows the effect of rilpivirine and estradiol either alone or in combination on the release of IL-8 from human adipocytes in culture for 10 days. The data reveal a significant (p < 0.05) release in IL-8 for only 10 µM rilpivirine compared to untreated control. The other drug treatments only evoked small increases (but not significant, p > 0.05) in IL-8 compared to untreated control cells. In this series of experiments the human adipocytes were pretreated with BNF followed by treatment with either rilpivirine or estradiol alone or during their combination employing different doses. The rationale was to ascertain whether BNF might exert an attenuating or potentiating effect on lipolysis and the release of adipocytokines from human adipocytes. 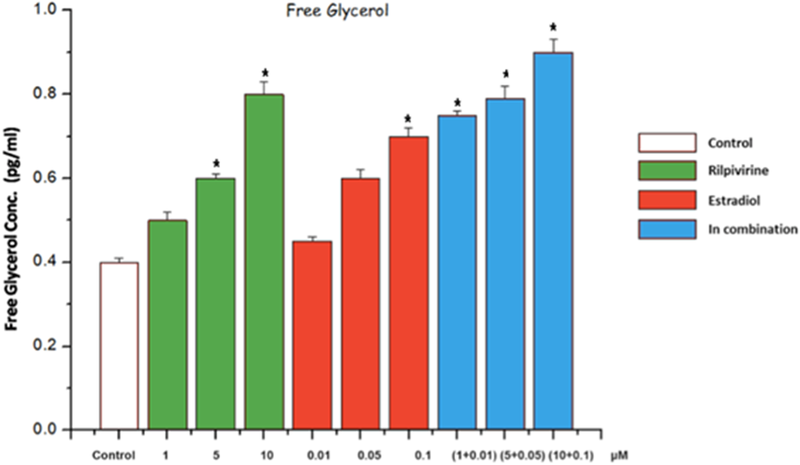 Figure 7 shows the effect of different doses of rilpivirine and estradiol either alone or following combination in the presence of 200 µM of BNF on the release of free glycerol from human adipocytes in culture over 10 days with the drugs. The results show that all drug treatments can evoke significant (p < 0.05) dose-dependent release in free glycerol compared to untreated control. These effects were much larger compared the results obtained in the absence of BNF (see Fig. 2 for comparison). Figure 8 shows the effect of different concentrations of rilpivirine or estradiol either alone or in combination and in the presence of 200 µM of BNF on the release of leptin by human adipocytes in culture for 10 days with the drugs. The results show that only 10 µM rilpivirine alone and 10 µM rilpivirine in combination with 0.1 µM estradiol with BNF can evoke significant (p < 0.05) decreases in leptin compared to untreated control. Figure 9 shows the effect of different concentrations of rilpivirine and estradiol either alone or in combination and in the presence of 200 µM of BNF on the release of adiponectin by human adipocytes in culture for 10 days with the drugs. The results show significant (p < 0.05) decreases in adiponectin release for all drug treatments compared to untreated control. The decrease in adiponectin level was dose dependent, but much more marked in the presence of BNF. Figure 10 shows the effect of rilpivirine and estradiol either alone or in combination and in the presence of 200 µM of BNF on the release of resistin from human adipocytes in culture for all drugs. The results show a significant (p < 0.05) release in resistin for 10 µM rilpivirine, all concentrations of estradiol and rilpivirine (10 µM) in combination with estradiol (0.1 µM) and BNF compared to untreated control. Figure 11 shows the effect rilpivirine and estradiol either alone or in combination and in the presence of 200 µM of BNF on the release of IL-8 from human adipocytes in culture for 10 days with all the drugs. 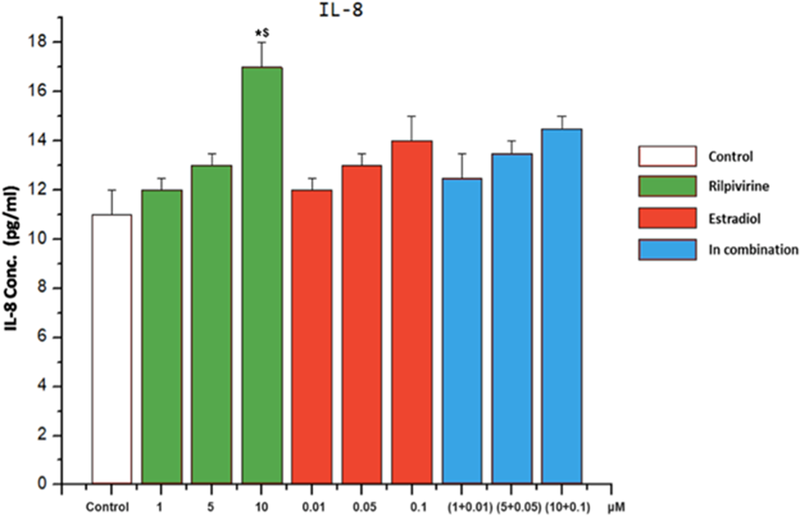 The results show a significant (p < 0.05) decrease in the release of IL-8 for 1 and 5 µM rilpivirine, 0.01 and 0.05 µM estradiol compared to untreated cells. The results of this study have demonstrated marked morphological changes in the adipocytes in culture over time. The cells were observed daily as they were proceeding through the foregoing stages of differentiation. Microphotographs were taken on day 0, day 5 and day 10 for comparison. The results show that the shape of the cells changed from the spindle- shaped fibroblast to the nearly spherical form of a mature adipose cell. There was an increasing accumulation of lipid, first as small inclusions concentrated towards one pole of the cell and then finally as large lipid masses in the central region of the cell. Viability of the cells were assessed on 0, 5 and 10th day of the adipocyte maturation process by employing lactate dehydrogenase as a marker to monitor cell death. Increasing concentrations of rilpivirine (1 µM, 5 µM and 10 µM) and estradiol (0.01 µM, 0.05 µM and 0.1 µM) were tried individually and in combination. The results clearly show that neither rilpivirine nor estradiol either alone or in combination with or without BNF had any deleterious effects on the viability of adipocytes compared to untreated cells. There was no significant release of LDH in stimulated or treated cells as compare to untreated cells. The viability of cells at all stages of adipogenesis, as measured by the lactate dehydrogenase assay, did not show any significant difference as compared to the control. Therefore, all these concentrations were determined as optimal for future experimental work. These results are in agreement with a previous study . Data from several previous studies have revealed that anti-retroviral and estrogen therapy induces lipid alterations by activating lipolysis and thereby, enhancing the levels of free fatty acid and free glycerol in adipocyte cell cultures [27, 28, 29]. The results of this study show an increasing trend in the lipolysis process in human adipocytes. The release of glycerol was dose-dependent with both rilpivirine and estradiol. Concomitant treatment of two drugs at all doses did not show any attenuation or potentiating effect on glycerol release, but only a small additive effect compared to the effect of either rilpivirine or estradiol alone. The observed results could be attributed to impaired GLUT4 translocation and are in keeping with another study that assessed the effect of nelfinavir on glucose uptake and lipolysis in differentiated 3T3-L1 adipocytes . An 18-h exposure to nelfinavir resulted in an impaired insulin-stimulated glucose uptake and activation of basal lipolysis with as low as 5 µmol/l nelfinavir . Another study conducted in vivo showed that exposure to high concentrations of estradiol led to region-and pathway-dependent modulation of subcutaneous adipose tissue lipolysis in pre-menopausal women . 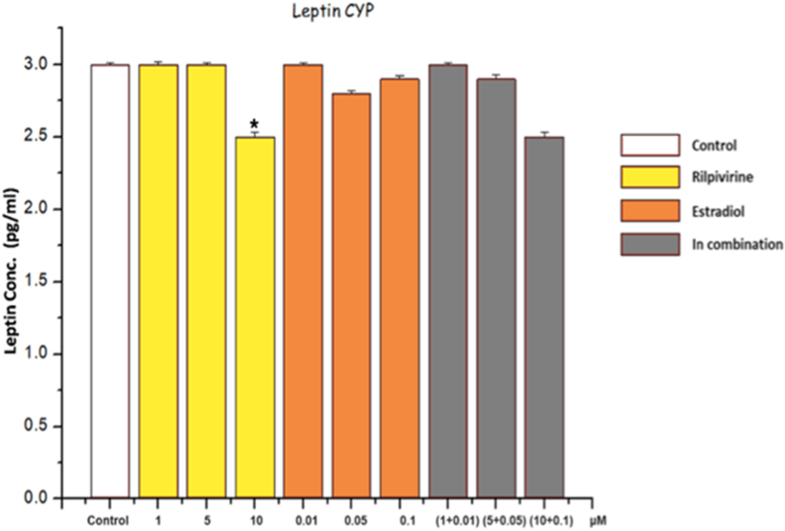 Leptin has been reported to be related to adiposity and it increases in proportion to decreasing adipose tissue stores. It is of much interest in anti-retroviral and estrogen-based therapies where abnormalities of body fat distribution are characteristic features. A number of in vitro studies have demonstrated a reduction in leptin secretion when human adipocytes were treated with ARVs [32, 33]. In this study, no significant release in leptin level were observed when adipocytes were treated with either all concentrations of estradiol or low doses of rilpivirine compared to a higher dose of 10 µM which elicited a significant decrease in leptin secretion compared to untreated cells. Similar results were obtained with the highest dose of each drug when they were combined. Previous in vivo and in vitro studies reported that estrogens can elevate the level of leptin [34, 35].However, some reports have indicated either a nil or a reverse relationship between estrogens and leptin release [36, 37]. 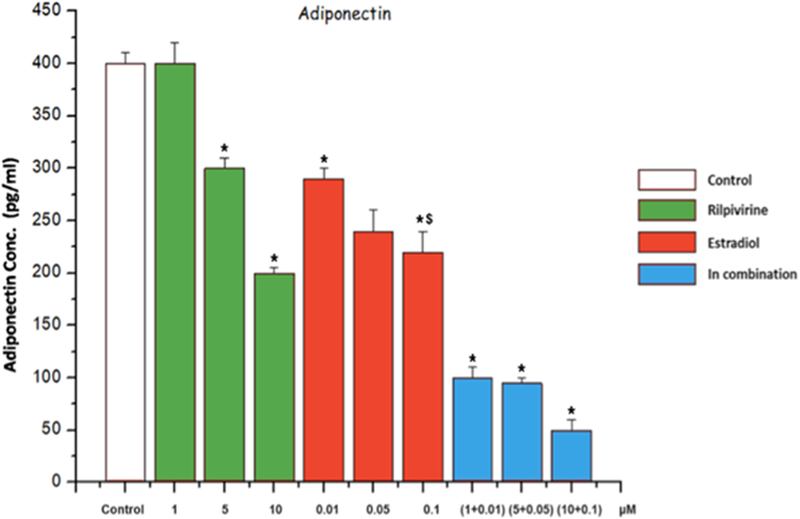 Adiponectin, an insulin-sensitizing adipokine, is induced during adipocyte differentiation . Reduced levels of adiponectin have been reported by various studies in adipocytes treated with very high doses of ARV drugs. In the present study, except for at a low concentration (1 µM) of rilpivirine alone, all the other drug treatments elicited significant effects on the release of adiponectin levels from human adipocytes. Combining rilpivirine with estradiol produced a much larger decrease in the release of adiponectin compared to their individual concentrations alone. Adiponectin is known to enhance insulin-mediated glucose uptake in peripheral tissues (i.e., skeletal muscle) and in sensitizing liver to insulin-dependent suppression of glucose output . This reduction may be considered as a major contributor to insulin resistance (IR). In this study, reduced levels of adiponectin were observed when cells were treated with increasing doses of 17β-estradiol. The present results are in agreement with a recent study that reported dramatically suppressed levels of adiponectin concentration when pre-adipocytes were exposed to increasing levels of 17β-estradiol . Originally, resistin was thought to be a link between diabetes and obesity. A single nucleotide polymorphism in the resistin gene has been associated with elevated lipids, IR and body composition changes among HIV-infected individuals on anti-retroviral therapies . In another study, greater plasma resistin levels were observed in HIV patients compared with uninfected controls . However, other workers have found no association between serum resistin and fat redistribution, and metabolic profile in HIV-infected patients [43, 44]. The physiological role of resistin, therefore, is not fully understood and needs further studies. It is proposed to be an important peptide bringing about IR and obesity, although it is still debatable .In the present study, the levels of resistin were comparable to that of control and there was no significant difference for pre-adipocytes treated individually with rilpivirine at low doses. Only a slight increase in the resistin level was observed at 10 µM, indicating that rilpivirine may contribute to the fat re-distribution but only at high dosage. A positive correlation in estrogens and resistin levels has been demonstrated and resistin concentrations were found to be conspicuously elevated by 17β-estradiol [40, 46]. The present study showed enhanced levels of resistin in adipose cells treated with different concentrations of 17β-estradiol as compared to control. Combination of rilpivirine and estradiol did not show any increase in resistin level for the lowest and median doses used in the study. However, an increase in the resistin concentrations was observed at the highest dosage of combination treatment (1 µM rilpivirine combined with 0.1 µM estradiol). Increased serum IL-8 levels have been previously reported in HIV patients with impaired glucose tolerance , and this is consistent with findings in T2DM , obesity and non-alcoholic fatty liver disease . Chronic inflammatory state in HIV-infection may be associated with elevated fasting serum level of IL-8. Higher serum IL-8 may also reflect increased production and release from the larger adipose depots and may have an influence on lipid metabolism along with its effect on insulin resistance. Elevated levels of IL-8 have been observed in human subcutaneous and visceral adipose tissue obtained from HIV-infected people with fat redistribution and insulin resistance . In the present study, IL-8 levels increased with an increase in the concentrations of rilpivirine. High concentrations of IL-8 were observed when the cells were treated with 10 µM of rilpivirine indicating its role in fat re-distribution. The present findings are in agreement with another study ,which reported that rilpivirine did not have any effect on the release of IL-8 at concentrations up to 4 µM, but instead, it produced a marked and significant elevation only at 10 µM. Compared to rilpivirine, estradiol evoked a dose-dependent increase in the release of IL-8 from adipose cells. Enhanced levels of IL-8 were observed when the pre-adipocytes were treated with increasing concentrations of estradiol. Moreover, increasing release in the level of IL-8 was observed when adipocytes were treated with a combination of rilpivirine and estradiol suggesting a major contribution of estradiol in eliciting the release of IL-8. In the second series of experiments human adipocytes were pretreated with BNF in the absence and presence of either rilpivirine, estradiol or when the two drugs were combined for a period of 10 days. The results reveal elevated glycerol level with BNF alone. When BNF was combined with either rilpivirine, estradiol or both drugs, there were enhanced release of glycerol in a dose-dependent manner. BNF seems to be potentiating the effect of either rilpivirine or estradiol on glycerol release (enhanced lipolysis) from human adipocytes. In contrast, BNF had no significant effect on the release of leptin from human adipocytes when combined with either rilpivirine, estradiol or with both. In this series, BNF also enhanced the decrease in adiponectin release from human adipocytes in the presence of either rilpivirine, estradiol or when the two drugs were combined compared to the results obtained in the absence of BNF. In contrast, in the presence of BNF, individual treatment of adipose cells with either rilpivirine or estradiol alone or combined did not seem to have any significant effect on the resistin and IL-8 releases for all the doses used in the study compared to the results obtained in the absence of BNF. In fact BNF seemed to induce a reduction in the levels of resistin and IL-8 as compared to levels in the absence of BNF. From the results of this study, it is possible to conclude that a combination of rilpivirine and 17β-estradiol is completely non-toxic to pre-adipocytes at most concentrations tested. During the 10-day exposure to the drugs, only estradiol produced a modest cytotoxic effect at the highest concentrations. No profound deleterious effect was on adipose tissue development or the endocrine function of adipose tissue (adipokine and cytokine release) in treated 3T3-L1 human pre-adipocytes. However, caution should be maintained considering that other transcriptional factors play a crucial role in overall alterations of lipid metabolism. BNF does not seem to significantly interact with rilpivirine and 17β-estradiol except for the release of adiponectin. Moreover, in order to establish and elucidate a significant effect of these drugs on the adipogenic process, studies at gene expression levels and involving the markers of oxidative stress are required. The authors declare no conflict of interests with respect to the present paper.